Periodontal disease is an ongoing infection of the gums that gradually destroys the tissues that support your teeth. While there are many diseases which affect the tooth-supporting structures, plaque-induced inflammatory lesions make up the majority of periodontal issues, and are divided into two categories: gingivitis and periodontitis. While gingivitis, less serious of the diseases, may not progress into periodontitis, it always precedes periodontitis. Periodontal treatment is necessary when various conditions affect the health of your gums and the regions of your jaw bone that hold your teeth in place. Retaining your teeth is directly dependent on proper periodontal care and maintenance. Healthy gums enhance the appearance of your teeth, like a frame around a painting. When your gums become unhealthy, they can recede or become swollen and red. In later stages, the supporting bone is destroyed and your teeth will shift, loosen, or fall out. These changes affect your ability to chew and speak and make your smile unattractive. Dental plaque is the primary cause of gingivitis in genetically-susceptible individuals. Plaque is a sticky colorless film, composed primarily of bacteria and food particles which adhere to your teeth at and below the gum line. Plaque constantly forms on your teeth, even minutes after a professional cleaning. Bacteria found in plaque produce toxins that irritate the gums. If daily brushing and flossing is neglected, plaque can also harden into a rough, porous substance known as calculus or tartar. This can occur both above and below the gum line. When plaque and calculus accumulate, the gums become red and swollen, and bleed easily. If this irritation is prolonged, the gums separate from the teeth causing pockets (spaces) to form between the tooth and gum. As these pockets get deeper, it becomes difficult or impossible to remove the bacteria in them by brushing and flossing. 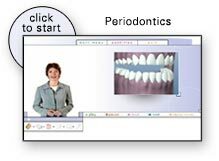 Gingivitis and periodontitis are directly caused by your body’s response to the bacteria found in plaque and calculus. If gingivitis progresses into periodontitis, the gum tissue and alveolar bone that holds teeth in place deteriorate. The progressive loss of alveolar bone, referred to as “alveolar” bone, can lead to loosening and subsequent loss of teeth. Periodontitis is a direct result of bacteria that adhere to the tooth’s surface, along with the immune response to these bacteria. Periodontal disease is dangerous in that it is often painless and symptomless. 80% of Americans will be afflicted with this disease by age 45, and 4 out of 5 patients with the disease are unaware they have it. It is important to maintain proper oral hygiene and regular dentist visits to reduce the risk of periodontal disease.